Across the region, local governments have installed more Internet fiber and conduit than they need, but they aren’t allowed to share. In November, Durango, La Plata County and Archuleta County may ask voters to give them more flexibility to lease infrastructure to private companies, and other communities are likely to float similar questions. Towns and counties across the region started a $4.1 million fiber-optic project to supply their staff and public and entities such as libraries with Internet. Durango, Pagosa Springs, Bayfield, Silverton, Mancos, Cortez, Ignacio and other towns and counties in the region participated, and those that have a connection outside the community are using the fiber-optic lines, said Miriam Gillow-Wiles, executive director of the Southwest Colorado Council of Governments, a consortium that brings regional governments together to work on projects that benefit all of its members. But a 2005 state law prevents local governments from directly providing Internet or leasing out a substantial amount of its infrastructure to private providers. It also prevents them from improving Internet service for locals. But the league was met with tough opposition from the industry, and it became clear to the league an amendment wouldn’t pass this year. Instead of trying to change the law on the state level, communities have started holding elections to opt out of it. The law allowed for local elections because the industry has substantially more flexibility to campaign in an election, Wilson said. Across the state, about 10 local governments have opted out of the law. One benefit could be increased competition. Allowing private companies to lease city infrastructure could make it cheaper for new Internet providers to enter a market, Wilson said. In Durango, the city owns about 19 miles of conduit, most of which holds fiber-optic lines, said Eric Pierson, the city’s information systems manager. About 14 miles are leased out, but those lines have excess capacity, he said. While opening up local government-owned lines for lease could improve Internet speed for some, there are still major infrastructure connections missing. “We’re sort of the end of the Internet world,”Gillow-Wiles said. The region relies heavily on a fiber-optic line that provides a connection to Albuquerque, and the Council of Governments would like to have backup lines in place to other cities. The council recently received a $75,000 regional planning grant to look at ways to improve fiber-optic infrastructure. The plan, which should be finished next year, will outline new routes for fiber-optic lines, she said. 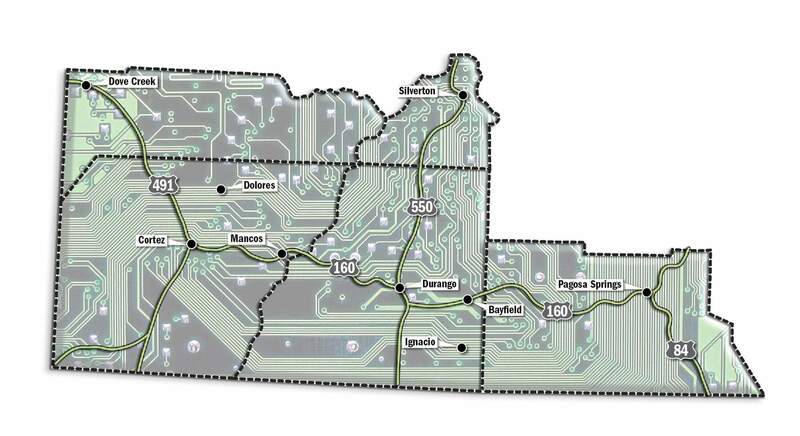 Fiber-optic connections are also lacking between Bayfield and Pagosa Springs, and between Durango and Silverton, Gillow-Wiles said. Once the regional plan is complete, the council will be more likely to qualify for state grants to build more fiber-optic lines for the future, she said. “We need to (build more fiber) or we’ll be a region the world passes by,” Gillow-Wiles said.